The Hobbits Source Blog recently reported on the profligate advertising spending of Missouri Democrat Attorney General, Chris Koster. Koster, is no stranger to finding innovative ways for Show Me State taxpayers to finance the campaigns of leftists like himself. His latest tactic leverages the budget of the Office of Attorney General. As you can see in the graph to the right, Koster's spending on advertising increased by over %400 from fiscal year 2011 to 2012. Missouri's fiscal year runs from July 1 to June 30, so this massive advertising outlay comes in the run up to the August primary and will no doubt help Koster's name recognition in the November general election. Given that advertising by the Attorney General's office will boost Koster's name recognition, does such an enormous outlay constitute an "in-kind" donation to Koster's campaign? Hobbits Source Blog also provides a ten year comparative analysis of the advertising expenditures of the Attorney General's office. That research makes clear that the 2012 expenditures by Koster are out of line with the historical pattern. 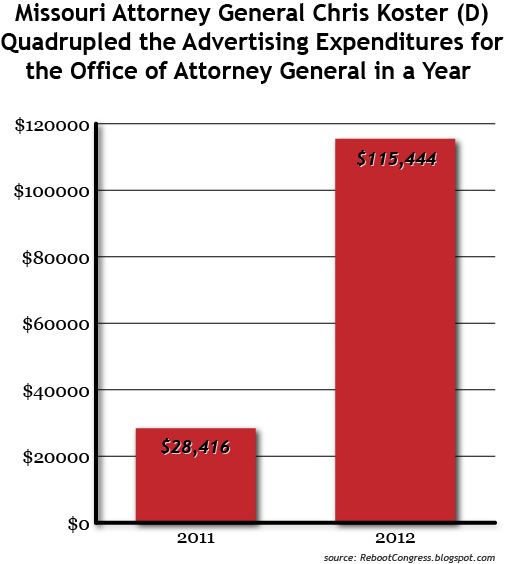 In particular, of the $483,801 that the AG's office has spent on advertising in the past ten years, 24% of that--$115,444--came in fiscal 2012. It's time to replace Koster with someone who will reform the AG's office. Republican Ed Martin is promising to do just that.